The SQL Server (SEREENASQL2008) service terminated with service-specific error %%-2146885628. Tried changing the startup account to LocalSystem account but it didn't help to fix the issue. 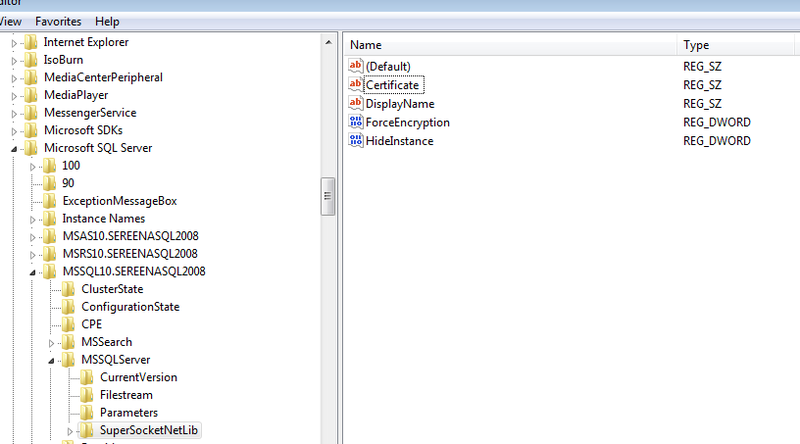 The error logged in both windows event viewer log also was not quite helpful. 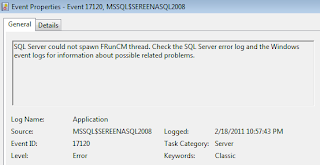 At this stage I decided to check SQL Server error log which was in the path C:\Program Files\Microsoft SQL Server\MSSQL10.SEREENASQL2008\MSSQL\Log. 2011-02-18 22:57:43.43 spid15s Clearing tempdb database. 2011-02-18 22:57:43.62 Server Error: 26014, Severity: 16, State: 1. 2011-02-18 22:57:43.62 Server Unable to load user-specified certificate [Cert Hash(sha1) "BCF96EB3346FFC3580D3D833B7C39D1021D88152"]. The server will not accept a connection. You should verify that the certificate is correctly installed. See "Configuring Certificate for Use by SSL" in Books Online. 2011-02-18 22:57:43.62 Server Error: 17182, Severity: 16, State: 1. 2011-02-18 22:57:43.62 Server TDSSNIClient initialization failed with error 0x80092004, status code 0x80. Reason: Unable to initialize SSL support. Cannot find object or property. Now this was interesting. I remember some two weeks back created a self signed certificate with IIS in my laptop and then installing it. The same certificate was used to enable SSL over IIS and SQL Server.Please note I have IIS and SQL Server in my laptop.I also remember deleting this certificate last week.So concluded that there is some issue with certificate generated by SQL Server. Deleted the value in Certificate key and then restarted the SQL Server service. Whoop it fixed the issue. i dont have any value inside what to do? 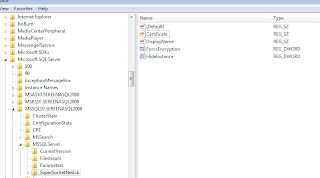 Please delete the value in certicate key in the registry and then start SQL Server service. Once sql server is started it will create a self signed certificate and update the value here.Hope it will fix your issue.